A board game about negotiations. 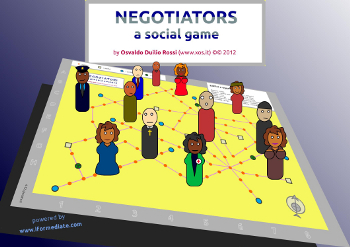 Negotiators is a board game based on your communication skills in which you must obtain informations from people, negotiate and respect or infringe pacts. You can play the game in 4-12 players, 16 years old or older. Negotiators is still on development: if you find bugs or if you think that you can enpower the gameplay, contact the author. > download the .pdf with the rules and the game's components ready-to-print (version 0.1). > Download the compressed folder .zip with the development game's components (best opening text files using LibreOffice and graphic files using Inkscape).